A Hosted PBX is delivered as a hosted service which is actually a private branch exchange (PBX). A traditional PBX system requires a lot of hardware and it is also expensive. A hosted PBX can be accessed through an IP network. It is actually a cloud-based PBX system. The system makes both internal and external telephone functions available. 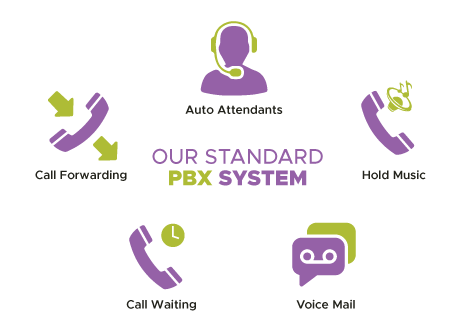 Why a small business need Hosted PBX System? Our hosted PBX phone systems can enable the smooth operation of businesses by providing reliable communication services. If you own growing business, alphaTALK hosted PBX can provide you with a multitude of features and benefits. There are several advantages that you will experience. Including the elimination of installation, operation and maintenance costs of a regular PBX as we host your PBX for you. What are the advanced features available of alphaTalk hosted PBX? Call Recording: Safely download, manage and store all of your important call recording files in one place. Voice Mail: Keep all of your missed call messages safe in your mailbox. Virtual Receptionist: Set up and manage a virtual receptionist for covering missed calls. Call Conferencing: Engage in a group call with up to 6 people. Call Forwarding: Divert calls to different external destinations with ease when using our call forwarding system. It is very simple and user-friendly. Call Statistics: You are able to view real-time call statistics. Keep updated with all your call activity. Mobile Apps: Access your PBX on the go through your mobile application. On Hold Marketing Message: Upload a voice message to market products while the call is on hold. On Hold Music: Upload music files for when putting calls on hold. Call Queuing: Put calls in a queue and get them answered by next available operator. What are the packages available of alphaTALK hosted PBX? There are two types of packages available of alphaTalk hosted PBX. Our VOIP phone system comes with full, unlimited technical support. Should you run into any issues, simply contact a member of the alphaTALK team via 0800 093 2193 or 0121 633 5200 for assistance.